On October 19th, 2017, the Panoramic Survey Telescope and Rapid Response System-1 (Pan-STARRS-1) telescope in Hawaii announced the first-ever detection of an interstellar asteroid – I/2017 U1 (aka. ‘Oumuamua). Originally mistaken for a comet, follow-up observations conducted by the European Southern Observatory (ESO) and others confirmed that ‘Oumuamua was actually a rocky body that had originated outside of our Solar System. Since that time, multiple investigations have been conducted to determine ‘Oumuamua’s structure, composition, and just how common such visitors are. At the same time, a considerable amount of attention has been dedicated to determining the asteroid’s origins. According to a new study by a team of international researchers, this asteroid had a chaotic past that causes it to tumble around chaotically. The study, titled “The tumbling rotational state of 1I/‘Oumuamua“, recently appeared in the scientific journal Nature Astronomy. The study was led by Wesley C. Fraser, a research fellow at the University of Queens Belfast’s Astrophysics Research Center, and included members from the Academy of Sciences of the Czech Republic, the The Open University and the University of Belgrade. As they indicate, the discovery of ‘Oumuamua has provided scientists with the first opportunity to study a planetesimal born in another planetary system. In much the same way that research into Near-Earth Asteroids, Main Belt Asteroids, or Jupiter’s Trojans can teach astronomers about the history and evolution of our Solar System, the study of a ‘Oumuamua would provide hints as to what was going on when and where it formed. For the sake of their study, Dr. Fraser and his international team of colleagues have been measuring ‘Oumuamua brightness since it was first discovered. What they found was that ‘Oumuamua wasn’t spinning periodically (like most small asteroids and planetesimals in our Solar System), but chaotically. What this means is that the asteroid has likely been tumbling through space for billions of years, an indication of a violent past. These latest findings mirror what other studies have been able to determine about ‘Oumuamua based on its object changes in its brightness. For example, brightness measurements conducted by the Institute for Astronomy in Hawaii – and using data from the ESO’s Very Large Telescope (VLT) – confirmed that the asteroid was indeed interstellar in origin, and that its shape is highly elongated (i.e. very long and thin). However, measurements of its color have produced little up until now other than confusion. This was due to the fact that the color appeared to vary between measurements. When the long face of the object is facing telescopes on Earth, it appears largely red, while the rest of the body has appeared neutral in color (like dirty snow). Based on their analysis, Dr. Fraser and his team resolved this mystery by indicating that the surface is “spotty”. In essence, most of the surface reflects neutrally, but one of its long faces has a large red region – indicating the presence of tholins on its long surface. A common feature of bodies in the outer Solar System, tholins are organic compounds (i.e. methane and ethane) that have turned a deep shade of reddish-brown thanks to their exposure to ultra-violet radiation. “We now know that beyond its unusual elongated shape, this space cucumber had origins around another star, has had a violent past, and tumbles chaotically because of it. Our results are really helping to paint a more complete picture of this strange interstellar interloper. It is quite unusual compared to most asteroids and comets we see in our own solar system,” comments Dr Fraser. To break it down succinctly, ‘Oumuamua may have originated closer to its parent star (hence its rocky composition) and was booted out by strong resonances. In the course of leaving its system, it collided with another asteroid, which sent it tumbling towards interstellar space. It’s current chaotic spin and its unusual color are both testaments to this turbulent past, and indicate that its home system and the Solar System have a few things in common. Since its arrival in our system, ‘Oumuamua has set off a flurry of scientific research. All over the world, astronomers are hoping to get a glimpse of it before it leaves our Solar System, and there are even those who hope to mount a robotic mission to rendezvous with it before its beyond our reach (Project Lyra). 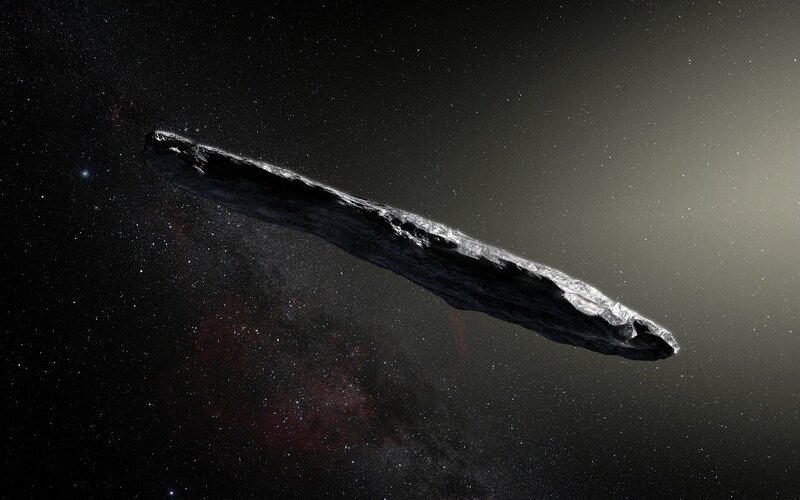 In any event, we can expect that this interstellar visitor will be the basis of scientific revelations for years to come! This study is the third to be published by their team, which has been monitoring ‘Oumuamua since it was first observed in October. All studies were conducted with support provided by the Science and Technology Facilities Council. How can brightness measurements determine that Oumuamua is indeed interstellar in origin? We have objects with different brightness in our own solar system. So is it really the data from the VLT and if so, what was that data? I can understand how this object might be rotating regularly about two axes, but not how it could be truly rotating “chaotically” as stated. My guess is it’s simply difficult to determine its regular rotations. Something very interesting is going on if its motion is actually chaotic. Previous PostPrevious What are the Chances Musk’s Space Tesla is Going to Crash Into Venus or Earth?